Chandrakant Sampat, considered by many as a doyen in investing in India’s capital markets passed away late Sunday. An inspiration to several of today’s investment gurus, Sampat made his wealth by identifying investment opportunities in the 1950s. Last June, Forbes India got an opportunity for a rare media interview with him, for a Wealth Wizards special issue. He came across as being not just aware of current investment strategies that today’s experts went with – he was also deeply concerned about the impact of economic expansion on earth’s depleting natural resources and environmental challenges. “We have become clever, but the wisdom is missing,” was what Sampat said, in a near-two hour long interaction with our team. Sampat, who was influenced by economist Peter Drucker, entered the Indian markets at a time when all one needed was “a cheque book and a pen.” Back then in the 1950s, the Bombay Stock Exchange, though still an association of brokers, was a functional bourse. Sampat began betting on companies such as Hindustan Unilever (then Hindustan Lever) and Indian Shaving Products (now Gillette India) in the 1970s, before they became investor favourites. “He was the Warren Buffet of India, who followed his advice to be fearful when others are greedy and greedy when others are fearful. Sampat was disciplined, not just about investing but all aspects of life,” Parikh said. Sampat, an octogenarian, in later years travelled by public transport (despite owning cars) and refused to use a mobile phone. “He spent several evenings at the Hindu Gymkhana and people often sought his investment advice when the markets were bearish,” Parikh recounts. “If you listened to him, the only thing you would get is wisdom,” Parikh adds. Sampat is an autodidact who has spent decades honing the art of evaluating the actions, not the intent, of corporate houses. He had one piece of advice for investors: look for companies with the least capital expenditure, where the return on capital employed should not be less than 25 percent. His discipline to investing, honesty and dry wit will be missed. 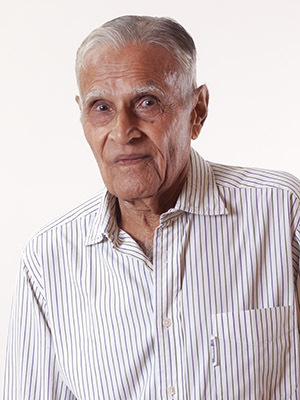 RIP Mr. Sampat. He was original Warren Buffet of India and followed same principles that Buffet followed after 80s. Investing in best businesses when they were available at sensible prices. He thought and behaved like a business man (or business partner) rather than a stock trader. That is the reason he stayed invested in many stocks for decades and in order to accomplish long term stay he insisted on consumer focused businesses with propitious Free cash Flow, solid return on capital (25% ) and stock holder focused management (unfailingly rising dividends). All Investors will do well by themselves if they emulate his thinking process. People like Sampat were inspiration for many of us individual investors. He showed us that it is possible to achieve success in stock market. And his passion for running (till very old age) was also inspiration for many of us. RIP Chandrakant Sampat. He gave me something when I was in my early teens which I have cherished every day of my life: a gift which led me to health, fitness and more. He gave me a book on running, which was the nudge I needed to get started... I remember him as a tall, lean, almost gaunt, athlete who would not talk about his greatest achievement unless prodded to do so: most people would discuss stocks with him and he was happy to go along. He was well known for his expertise in the stock market and the story of how he began on Dalal Street is an interesting one. More interesting is the story of how he started running. Legend has it that he was diagnosed with a heart condition in his youth. Doctors instructed complete bed rest and forbade the use of stairs, which restricted young Chandrakant bhai to his rooms in a building which was sans elevator. Naturally he could not tolerate this beyond a few weeks and one fine day, despite warnings from his doctor and protests from family, he stepped out and resumed living a normal life. Thereafter, much to the disapproval of his doctors, he was going for small jogs which increased in duration and speed till Chandrakant bhai was jogging / running an hour or two every day and four on Sundays. The doctors finally gave up on him and declared him fit. Running remained an important part of his life for many years. He told me that he would keep running till his knees let him. His advice to me, in response to any question about running, was to get plenty of sleep. Sleep well, Chandrakant bhai and thanks again for getting me started.